Six experts came to get acquainted with the experience of the project which uses wild horses, wisents and backbred aurochs to preserve wild steppes. It has gained international success thanks to two world primacies. In 2015 the locality has become the first nature reserve in the world with all three crucial species of original European big hoofed animals. This year the reserve became the first one in the world where all three species succeeded in reproducing in one place. 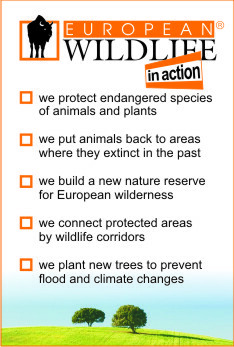 ‘‘WWF was a great example and inspiration for us at the time when we were founding our organisation. That is why we were very pleased to be able to welcome its representatives to our reserve,’’ stated Dalibor Dostal, the Director of European Wildlife conservation organisation. It was not just a courtesy call from the side of the Austrian organisation. The tour members were interested in specific details connected with countryside management with the help of big hoofed animals, which they could use for similar projects that are now being realised or are planned for the future in Austria. Tomorrow the specialists from Austrian WWF will finish their Czech Republic visit by seeing Podyji National Park.